I have felt sorry for Kane through several books so I love seeing him get to be the hero. I really enjoy this author and so I'm always excited for a new book :) thanks for sharing! LOVE me some Gena Showalter novels! My favorite part of the summary is how Thane is the most violent assassin in the skies but Elin stokes a fire in him...maybe she is his savior! they are forced to make a choice: live apart…or die together. I cannot wait to read both books! I am a huge fan of Gena! I love books with Fae creatures so The Darkest Craving sounds really good. And a royal at that! Love, and a "bodyguard". What's not to love about that! I like that he protects her. Thane! Oh my this cover is so perfect and I can not wait to read it. I've always loved her books. Love that she has tortured heroes that find love. 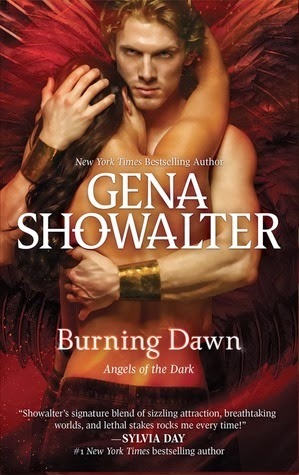 I haven't had the chance to read any of Gena Showalter's books but I have a few on my to-read list already. I'm really excited to start her series though. If I happen to win this one, I'll have a reason to catch up. Thanks for the great giveaway! The best part of the summaries is that they bout have a male and female lead. Both are tortured and is running away. I like this very much! I love Gena's books so the summary is such a tease! I always can't wait to read anything by Gena! Gena Showalter writes the best paranormal books out there! I love the Lords of the Underworld and Angels of the Dark! I love Gena Showalter books!! !